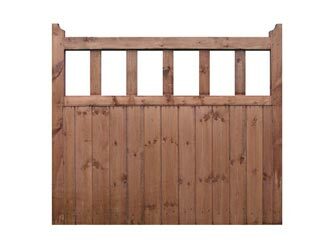 Premier's traditional front garden gates are made from 75 mm x 50 mm planed-all-round (aka PAR) untreated timber, clad with 19 mm x 100 mm V-jointed tongue and groove boards on the lower section. They can be paired to give a double-leaf arrangement for wider openings. Recommended Gate Post size is 4" x 4". For post height use 2 ft more than the height of the gate to permit foundations.